The 90s is the full maturity of TVB martial arts dramas. While the actors and actresses of the 90s may not be able to compete with the talent of the 80s, there were visible improvements to plotting. This period also saw a whole slew of Jin Yong adaption remakes, along with a lot of spinoffs from his stories and characters - most of the spinoffs were not too notable though. The last remake in the 90s, The Flying Fox of Snowy Mountain 1999 and then the subsequent Heavenly Sword of Dragon Saber 2000 were probably what triggered Jin Yong to stop licensing his works to TVB to remake. For me, it also signalled the end of an era for TVB martial arts dramas as the quality has never quite reached the same level again. This is the sequel to "Gods and Demons of Zu Mountain" and is a story of the battle between good and evil. Ekin Cheng is good at portraying the evil Blood Demon and had good chemistry with Nnadia Chung. Their love story and the sub plots moved along the story and the ending was memorable. The themesong sung by Deric Wan and Nnadia Chung was also one of the best in the 90s. Adapted from Liang Yu Sheng's novel, Ada Choi plays the spurned White Haired maiden and gives a good run for a divergence from the usual run-of-the-mill Jin Yong loosely-based adaptations of the 90s. Timmy Ho plays her lover but it is really Ada who steals the show. Hugo Ng's prime at TVB was during the late 80s and early 90s where he starred in martial arts dramas such as The Jade Fox and The Black Sabre. He puts up a good performance here as the detective in ancient times and was very compatible with his female costars Anita Lee. TVB really started to experiment with other fantasy and martial arts writers more in the 90s and "God and Demons of Zu Mountain" was one of its ventures into fantasy novels written by Huan Zhu Lou Zhu. It is interesting that for the first time, two women characters are really the destined ones to lead the world out of darkness, rather than a male hero. There's a fish out of water feel as you journey along with Pauline Yeung's character Li Zi King. Anita Lee as the other female lead, Zhou Qing Wan, was also good and Eddie Kwan fitted naturally as the heroic Sheung Guan Ging Er. Aaron Kwok is teamed up with three beauties (Ada Choi, Noel Leung, and Fennie Yuen) to tell a story of about destiny that a young man must fulfill. This is a drama that starts out light and then gets serious and it works because the plot flows. Aaron is likeable as the commoner turned hero while all the women give a believable performance - even though Ada and Noel were newcomers fresh from the Miss Hong Kong Pageant. It's funny to see Leung Kar Yun mock himself too as he usually portrays a serious martial artist. Ding Pang is a character who in many ways remind me of Yang Guo and that's why Louis Koo was a good casting for this Gu Long hero. Ding Pang is not your typical hero since he was bent out for revenge, lusted for martial arts power, and also didn't care what others thought of him - but that's what makes this story interesting. His lover, Ching Ching, played by costar Noel Leung was the right foil for him. The leads, Chilam Cheung and Athena Chu, had huge shoes to fill since the 80s version was such a success. Athena especially had a lot of pressure to live up Barbara Yung's Wong Yung and it showed in her performance as it was forced in many instances. A core essence of Legend of the Condor Heroes is Wong Yung and though look-wise Athena is a great casting pick, she didn't look comfortable finding her own interpretation of this character. Chilam's baby face also made Kwok Jing too cute but he fared better. You just didn't really get the same feel as Felix Wong's version of a character who grew up in the rugged Mongolia and eventually grows up to be a great hero of the times. So even though the story is faithful, it felt like a blander version from the 80s, mostly because of the casting picks. 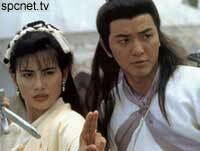 The 90s version of Return of the Condor Heroes made me a believer in Yang Guo and Siu Lung Liu's love. Other than a bad choice on TVB's part to not use child actors to play the earlier parts during Yang Guo's teenage years, this version was actually better than its Legend of Condor Heroes 90s counterpart because of the leads. Louis Koo and Carmen Lee were newcomers and got better and better into the series and had great chemistry together. Louis seemed like the ideal person to play Yang Guo in the 90s because he naturally gives off a rebellious and misunderstood feel. The Demi-Gods reboot couldn't compete with the 80s version for its cast and costumes, but because TVB chose again to remain faithful to Jin Yong's novel, everything flowed. It told a better story than the 80s version while Felix Wong stepped up as the tragic Kiu Fung into the series after a stiff start. Carmen Lee followed Idy Chan's path and also portrayed Wang Yu Yan after her casting as Siu Lung Liu in Return of the Condor Heroes. Benny Chan as the lovesick Duan Yu was also a character you rooted for. This is probably the best "Smiling, Proud Wanderer" adaptation made to date. The story is mostly faithful to the novel and it managed to capture the essence of the story and characters. Jackie Liu played a great carefree Ling Hu Chong while Fiona Leung also fit in naturally as Ren Ying Ying. The music soundtrack had tracks from "Ashes of Time" and attributed very much to the mood of the series. The only downside was the costumes, but the plot more than compensated for it. If you are a Jin Yong purist, this is the drama to watch. Tell us what your favorite 90's drama is below! See our best of the 80s list!